As of firmware 6.5 and higher two failsafe events are built in. In the config two low battery voltages can be entered for two stages of detection. The defaults are 3.6v and 3.3v per cell. 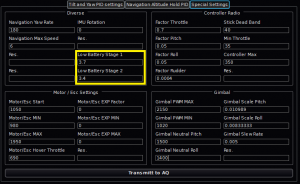 AutoQuad will automatically determine the number of cells in a LiPo battery. Both stages will trigger a warning sent through Mavlink messages. If you have external signaling devices connected (LED/beeper), each stage will generate a diffent flashing/beeping pattern, depending on severity. Be careful not to set the voltage to low! Setting it lower then 3.3v per cell is a sure way to make the AutoQuad copter loose control! These are only guidelines, if the AutoQuad copter is 500m away and stage 2 is triggered there maybe not enough capacity left in the battery to return the copter. Make an educated guess what your flying plans are and act accordingly. 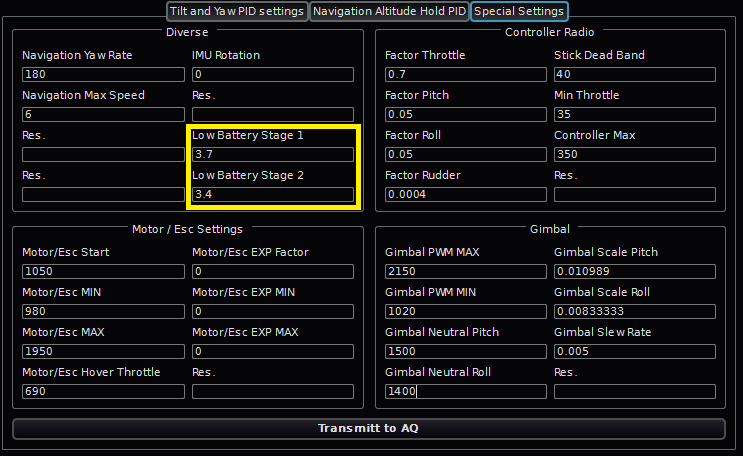 When the AutoQuad is in mission mode, the lost signal detection will not trigger any events before ending the mission. Two stages of detection are available. Stage 1 will be triggered after 1 second lost signal and engage position hold until the signal is regained, or stage 2 is reached. Start a slow descent while maintaining current position. AQ will attempt to detect a landing “bump” and disarm itself. Go directly to home position and altitude, then start a slow descent/landing. If below home position altitude, first ascend to that altitude, then return to home, and then descend. For options 2 or 3 to work properly, a home position must be properly set (using the Set Home switch/function). Home position is automatically set when you first engage position hold, but this might not be the ideal location. If you’re using option 3, you probably want to set home altitude high enough so that a return to position from any flying location will clear all obstacles in the path (trees, etc). If home position is not set prior to failsafe stage 2 activation, then the craft can only perform option 1, which is a slow descent. Before you rely on failsafe in flight, please test if the Radio Quality signal in the GCS realtime viewer will drop to 0 (zero) when you switch off the transmitter. If not, your RC receiver might be preventing proper detection of radio signal loss. The failsave events and there actions are set in the supervisor.c file.